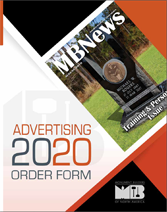 MBNews is the official monthly publication of the Monument Builders of North America. The Issue date for MBNews is the first of every month. To define and promote memorialization in a viable, innovative and diversified way for the membership and to enhance the awareness of memorialization by the general public and the remembrance industry. MBNews’ mail-out circulation is nearly 1,000 copies. Its subscribers are MBNA members in North America with about 60 of those outside of North America. Members are primarily owners of monument retailing companies or Certified Memorialists® within a monument builder shop. These are the key people who buy and specify products and supplies—everything from granite, small hand tools used in the industry, to trucks and truck-mounted cranes. The companies range in size from one to two person operations to companies with 30 or more employees. The pass-along readership is very good within these companies. Total readership of any monthly issue is estimated at up to 3,000 people who buy or specify products. In addition, because of the “art” aspects of memorials featured and the high quality of the magazine, readers tend to keep their copies available for future reference. Your ad placed in the MBNews will receive great exposure over a long period of time. To our subscribers, it is more than a publication; it's a business tool that helps them produce meaningful results. WHY Do They Read MB News? Each month, MBNews focuses on bringing timely editorial content of high interest to its readers. The latest and best in memorial art—from personalized memorials for individuals to largescale public memorials. Information that will help readers in their day-to-day business operations. 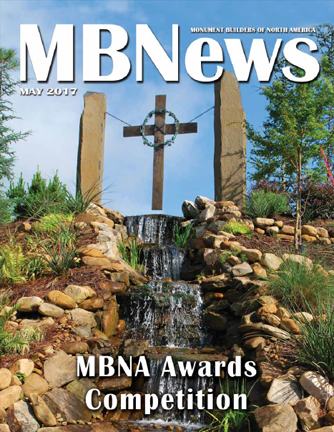 Stories, columns and case studies with MBNA membership focuses on creativity, innovations, trends and a worldwide view of memorialization. PLUS—Important industry and association news. We invite you to participate in the development of these special features for all our readers. Share your ideas and information. If you can contribute photos, tips, anecdotes or provide some good leads, please contact Don Mounce at mbnews@monumentbuilders.org or contact MBNA Headquarters at 800.233.4472.